As Bob Dylan famously crooned: How many roads must a man walk down before he says: this compass is broken? My compass has been giving me some questionable readings for a while now. It’s high time I had a good look at where I am, take some bearings, consider some important questions. 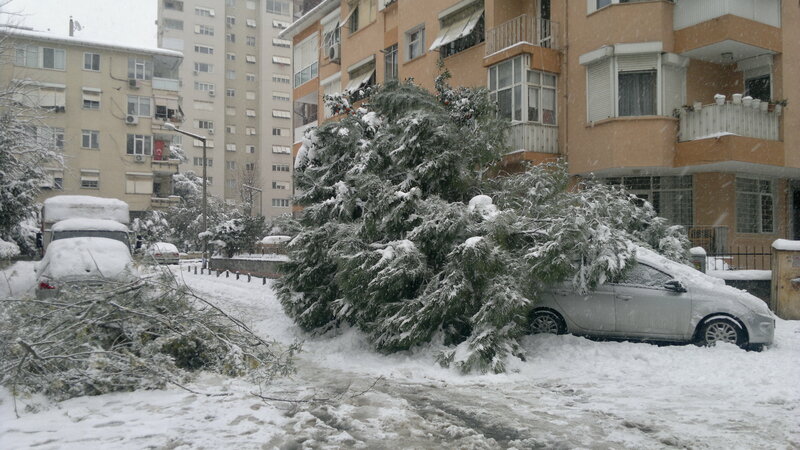 Last week saw another couple of snow days come Istanbul’s way. They are a bonus from on high, from the patron saint of teachers (yes there is one apparently and the clue to her identity is the opening image) working a little magic to reward her faithful disciples. My domestic arrangement for snow days is that I get a good chunk of the day to myself, as long as I make myself scarce i.e. go out. No problem there. 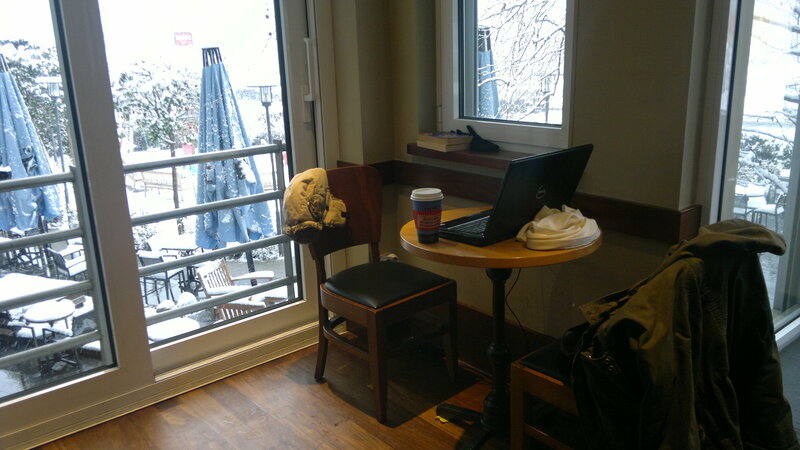 The number of snow days we’ve enjoyed this winter has led to me becoming quite familiar with this table in this coffee shop that overlooks the Sea of Marmara. It’s not the best coffee in town but it has a good ambiance and Wi-Fi and it’s warm and it’s within a fifteen minute walk of home. I find this time productive – I usually add a couple of thousand words each day to my latest writing project – and enjoyable – there’s coffee, it’s quiet and no one bothers me. It’s also given me time to think on a few of those burning questions: Where am I? Where do I want to be? How long have I got to get there? Can it be done? What am I prepared to risk/sacrifice on the way? I know the answers to these questions, I really do, and I know what needs to be done in order to get to where I want to be. But I also know that if I follow my dreams, as the lyrics go…there may be trouble ahead. Couple of photos I’ll include because I took them. There are quite a few fir trees dotted around the streets where I live. I had no idea that snowfall could have such an effect on them. Lots of limbs off and several big trees toppled over under the strain. Probably something to do with stunted root systems. I wonder is he was insured for trees falling on his car. This entry was posted in Self-publishing and tagged olivertidy by olivertidy. Bookmark the permalink. I know where you are heading Oliver. Good luck in getting there. Hope you are able to surmount all the obstacles without too many tears. Thanks Emmy. I appreciate your kind words. Time will tell. I don’t think the tears will be yours, but I do hope the tearful one will soon get over it and adjust. You might not have so much time for writing though!! Oh, dear, Oliver, I get the impression you are going to do something rather drastic. As Emmy says, good luck, and although tears will be spilt, always remember what Edith Piaf said, Je ne regrette rien. I think I am. I don’t want any regrets either, or should I say, I’d rather regret the things I did than the things I didn’t. I am in the process of writing a blog about life and regret as I am now of the age when I am looking back at my life. It’s called ‘Je ne regrette rien’ and should be on in a few days time. Whatever else you do, though, Oliver, just don’t give-up the writing as you have a lot of fans out there. I like to look upon myself as your ‘virtual’ friend, though, so ‘bon chance’ und ‘das Gluck’ in everything you do. Hi Oliver, two things. At first glance of Catherine’s lovely portrait I thought the object in her hand was an extremely sharp and vicious looking sword/pointy thing for the removal of young unruly Turkish children who are rude to their English teacher. Beats the bits of broken chalk my French teacher used to frequently lob in our direction. Secondly, and concurring with the others, by all means leave the kids behind, but please keep up with the writing. Oh and by the way I too was disappointed with I am Pilgrim, even more so as it was a Christmas present. Still the upside was I stopped for He Made Me… or perhaps I should say ‘he made me stop’. Andrew. As the patron saint of teachers I think she is being coyly suggestive of what works as a behaviour management technique in the classroom – one word out of place and you’re run through. You’ve rumbled my plans I think: ’tis my work situation that I toss and turn about. Can I make writing pay as a day job? Should I take the chance? Still pondering that one. I want to write more not less. I Am Pılgrim just became too far fetched and just a little ridiculous for me. (Pots and kettles, perhaps.) Did you get as far as the mirrors providing photographic images? Coming so soon on the heels of a clutch of total inaccuracies where our hero finds himself in Bodrum, Turkey I gave up. (Roasted chestnut sellers in the airport in the summer? I just laughed. Chestnuts in the winter, summer fruıts in the summer. And no way at an airport. A FEMALE HEADSCARF wearing Turkish detective? I’m not even going to start on synthesising deadly virus’ in garages. I looked at some of the 1* reviews on Amazon and felt pretty much the same, although ıt’s certainly not a 1* read. I have to admit I didn’t reach the photographic mirror (thankfully). I did notice on a previous post, that on your pile of books returning to Turkey with you, you had the Peter May trilogy. Now they were a really good read in my humble opinion. Total sympathies over job anxiety and which way to go, if only heart, head and gut would engage in helpful conversation with each other rather than pulling in opposing directions! Read The Blackhouse and enjoyed it. Looking forward to the others. I got the trilogy in The Works 3 for £5 if you can believe it. Amazing! I’m still waiting for my tea leaves to give me the nod over my destiny. I’m not sure I can make that decision myself. Not sober, anyway. 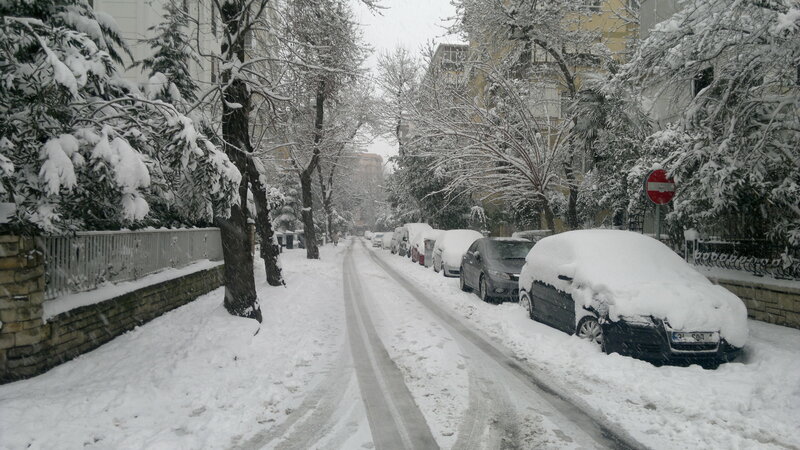 I lived in Istanbul for three years and quite enjoyed the snow when it came, also loved the food, a great sea food place overlooking the Bosphurus at Kardicoy called the Deniz. Also Peter Mays Entry Island is a really good read. Though I am loving your books. It is a great city for the most part with many great places to eat. Kadikoy is one of my favourite places. Not particularly glamorous but for me it’s the ‘real’ Istanbul, away from the tourist traps. I enjoyed The Blackhouse by Peter May. Looking forward to reading more of him. Thanks for your kind words for my books. Good to know that you’re enjoying them.